Why Consider Home Buying in Jade Ocean Sunny Isles? The small strip in North Miami Beach called Sunny Isles Beach has become one of the world’s top destinations for buying luxury brand condos. Real estate investors and people who love to live directly on the ocean purchase properties in this area. The Sunny Isles Beach is located directly on the Atlantic Ocean and offers most extravagant oceanfront lifestyle. It is also one of the most popular tourist destinations as it offers top notch hotels, restaurants, shopping and of course the beaches. The condos here are newly built and offer a range of ultra-luxurious features and amenities for the most lavish lifestyle for residents to enjoy life at the fullest. The Jade Ocean condominium situated in the Sunny Isles Beach is one of the most appealing and astounding structures that allure real estate property buyers. The picturesque and active ambiance of the Sunny Isles Beach makes the real estate luxury properties in this area highly attractive and awe-inspiring. If you have the desire to purchase a compelling property in a gorgeous beach location, then the Jade Ocean condo would be the ideal the choice for you. The city of Sunny Isles Beach is one of the top tourist locations in South Florida and is a place that is easily accessible from all the major metropolitan areas like airports, shopping malls, etc. The art deco edifices, fine gourmet, multi-cultural fragrance, and scintillating nightlife makes this place the most desirable beachside residential areas all over the world. The tower of Jade Ocean in the Sunny Isles Beach is one of the most striking edifices that appeal to the condo buyers all around the globe. This condominium belongs to the elite class residential edifices and caters to a diverse range of high-end clients. This condominium structure is designed by the popular architect, Carlos Ott, who has a worldwide reputation for being the best architect designer. The marvelous state-of-the-art amenities of Jade Ocean demonstrate the transformations, which the conventional homes have undergone over the years and the magnificence justifies the intensity of admiration of these new-age homes. 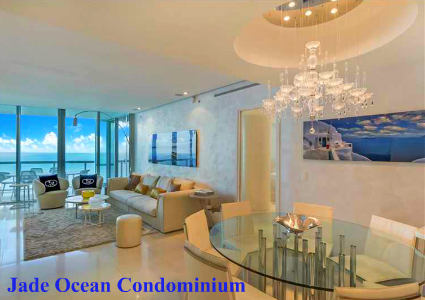 If you wish to acquire a splendid property in this condominium, then get in contact with sales person of One Sotheby’s International Realty Sunny Isles Branch. The 51-storey high spellbinding structure of Jade Ocean incorporates 256 spacious units, which features unique residential amenities that reflect the magnificence of new-age, high-tech homes. The residences of Jade Ocean are incorporated with advanced high-tech features that make the life of the residents extremely lavish and comfortable. If wish to live in an extravagant beachside home, then you should consider acquiring a home buying experience in Jade Ocean Sunny Isles. The outstanding structure of Jade Ocean located in the most beautiful setting of Sunny Isles Beach offers people the opportunity to enjoy a blissful beachfront lifestyle with access to all the luxurious amenities. This palatial all-glass monumental tower is recognized as the Sunny Isles Beach most desirable properties. This spectacular luxury edifice is South Florida’s top architectural wonders. Now, if you dream to live a futuristic lifestyle in a gorgeous beach location, then residing in the magnificent tower of Jade Ocean should be the best choice for you. This high-rise luxury development features unique residential amenities like all-day concierge services, private valet services, 24-hour security services, access to beachside cafes and cabanas, well-equipped state-of-the-art fitness center, walk-in closets, spa services, and much more alike. The units of this regal edifice offer luxury amenities like spacious rooms, floor-to-ceiling glass windows offering panoramic views of the Intracoastal waters, capacious balconies, oversized terraces offering mesmerizing views of the surrounding areas, modern kitchens with advanced state-of-the-art appliances, master bathrooms with infinity-edge whirlpool tubs, and many more. Apart from this, the luxury units of Jade Ocean are integrated with smart home technology features. Smart-home technology is an in-home touch screen feature that facilitates easy control over the in-residence amenities and also offer convenient navigation facility to nearby areas. This high-tech feature makes this splendid monumental tower the top preference of the condo buyers across the globe. So, if you are in the market to purchase a palatial luxury property across the coastline of the ocean, then you should consider buying a luxury property in Jade Ocean. To purchase a lavish residence in Jade Ocean, you should get in contact with the on-site sales representatives of One Sotheby’s International Realty Sunny Isles Branch at (305) 998 9922 or you may also visit their website in case you need additional information about the realtors or the condominium. Thus, now if you desire to live a luxury coastal lifestyle, then you must check out the palatial luxury properties located in the gorgeous city of Sunny Isles Beach.